NEWMAR NEWS: A remake of BABY JANE? Some Julie fans have wondered about some of the recent portraits of her, which they find "morbid," black and bleak. It's a shock because on Facebook she usually posts pictures of herself at home in one of the sunniest and most colorful gardens in California. She also posts all those vintage pictures of Catwoman and other roles that involve a inscrutable smile. Perhaps the pictures (one of them borrowed for the collage below) will have someone thinking, ""Hmm...when we need a new Cruella DeVille, let's audition Julie Newmar. Julie's image has always been playful, but the right role could change that. Some may recall "If...Dog...Rabbit," a movie that was unfortunately a bit botched in the editing and direction. It could have signaled to Hollywood that the mature Julie Newmar can take on very dramatic roles. Her very brief scenes in that one hinted at what she could do in a realistic drama. Or...villainy with that important touch of sardonic satire. As they got older, Joan Crawford and Bette Davis, both veterans of many a romance movie, became campy stars of horror films. They were soon joined by Olivia De Havilland, Tallulah Bankhead and others who brought out an ax, a knife, a gun or some poison to become the Mother of All Nightmares. An entire genre sprouted up for people scared of women in general, and having mother issues in particular. 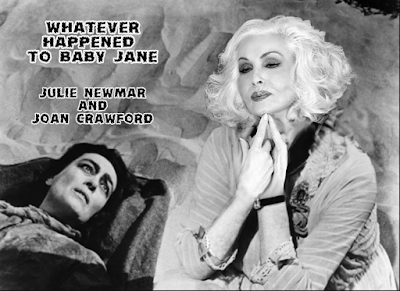 Here's a fantasy of Julie raising chills and smiles at the same time...who would you put in the Joan Crawford role opposite her? ?